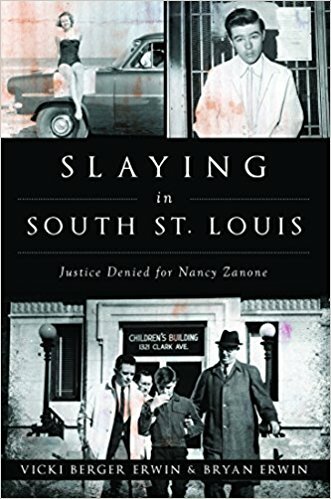 “Slaying in South St. Louis – Justice Denied for Nancy Zanone”(published by History Press) revisits a decades old murder, and recounts the subsequent life of crime of the killer. Nancy Love was born into a very loving family. Originally from Overland, Missouri, the family eventually moved to South Saint Louis. Nancy had a younger sister, Joan, and they were virtually inseparable as they grew up on the South Side. Nancy loved to dance, but she said she would give up dancing when she married and started a family of her own. Nancy married her high school sweetheart, Don Zanone, on September 3, 1955 at Fry Memorial Methodist Church. They were crazy in love with each other. They had two children. Laura was born February 2, 1958. David was born June 27, 1961. Joseph Arbeiter was born into a troubled marriage. This son of Joseph Sr. and Wilma Arbeiter was born June 15, 1948. Joseph Sr. was a decorated World War Two and Korean War veteran. He was also an abusive husband and father. The entire Arbeiter family was continuously subjected to his abuse. Joe Jr. always had a fascination with knives. As he grew into his teenage years he became quite well known to Police officers in the neighborhood. He typically was a shoplifter but, as he grew older, his long list of crimes grew to include petty theft and burglary. On December 2, 1963 their worlds collided, with disastrous results, as Joe drew his knife from his belt. Laura and David Zanone were playing in the back yard of their South Saint Louis home. Joe Jr. appeared and asked if their mother was home. The kids answered yes. Joe entered the apartment anyway, through its unlocked front door. Joe stabbed Nancy Zanone to death. Joe was convicted of the murder and sentenced to life in prison. The conviction was overturned on a technicality. Joe apparently went straight for a few years. He eventually committed another murder, but he was found not guilty. He descended into a life of crime. He was finally imprisoned for the murder and dismemberment of another woman. Joe served only six months in prison for that killing, dying in June 2015. Slaying in South St. Louis reads better than a crime novel. This is true crime, and the Erwins have a created a narrative that draws readers in and keeps them on the hook throughout the text. The book also explores the psychological impact of the murder on Nancy’s family, especially her children, and that fact that Nancy’s husband won’t discuss the crime, to this day. The authors have also taken advantage of the fact that many other people connected to the case are still alive today. They were able to gain access to original trial documents. Nancy’s murder, and Joseph Arbeiter’s subsequent life of crime, were extensively covered by Saint Louis newspapers and television. The Zanone family has suffered the same fate that many families of victims of crime still suffer today – an absence of justice. Murders, and other crimes in the Saint Louis area, go unsolved for years, even decades. Slaying in South St. Louis is a well-deserved epitaph for Nancy Zanone. Thank you so much! So glad you liked the book.